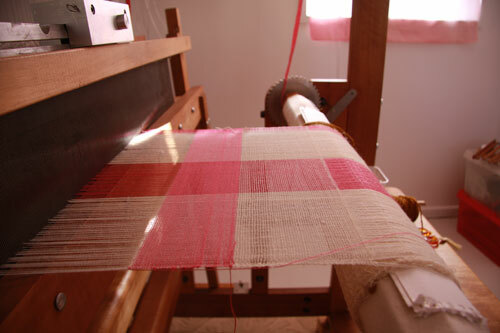 Well the pink and white warp is woven and off. I am disappointed with both scarves as the over twisted wool was not over twisted. 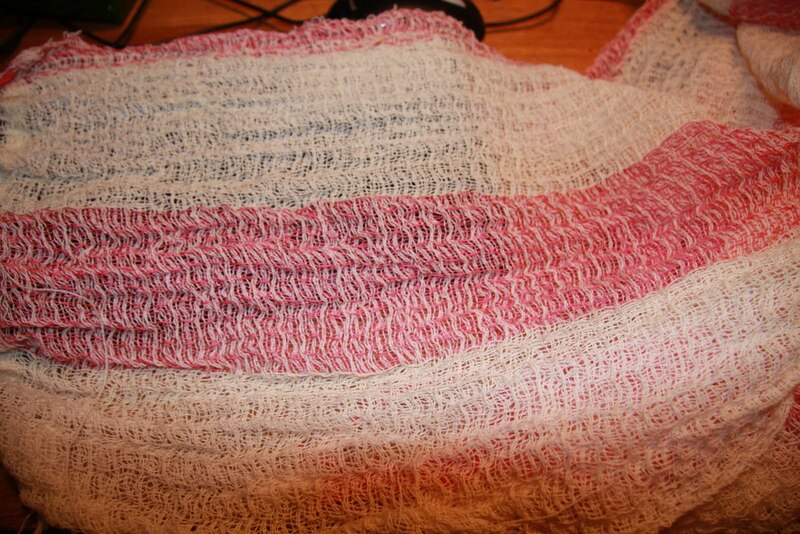 Well it certainly looked it and the sample twisted but when woven it has a slight crinkle and the scarves just look a bit messy. 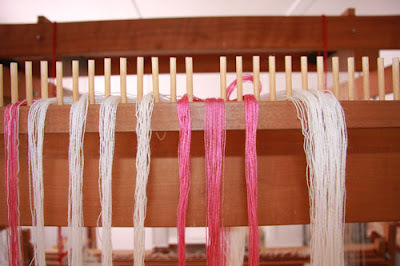 Weft over spun wool and the warp is wool, over twisted wool and polyester. 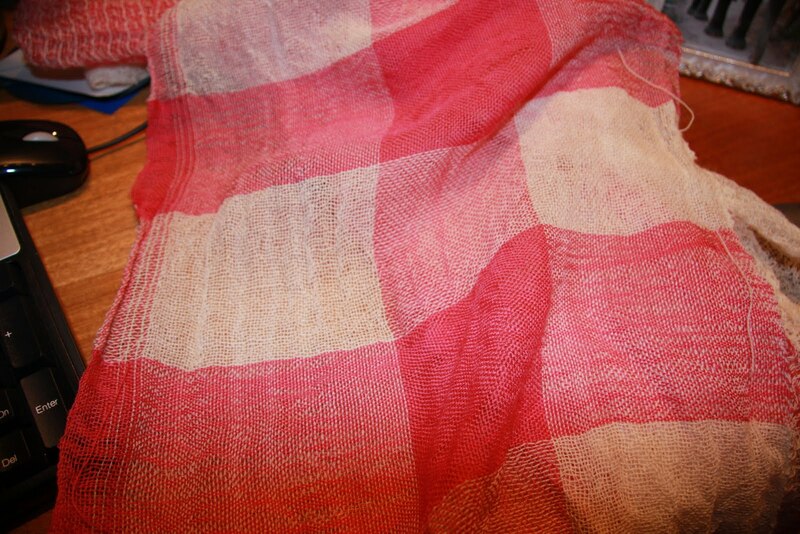 With the neck wrap I was hoping for stripes of over twisted wool that would be pulled in tight and the polyester making a ruffle alas not to be, well we live and learn! 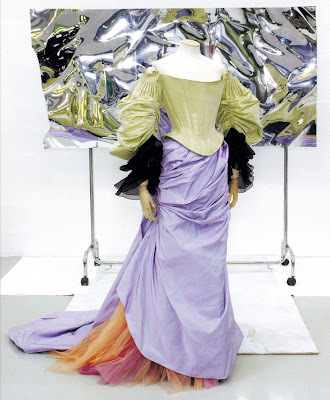 After a little more research for the Lacroix influenced exhibition, and reading about the Winter 2006 (I think!) collection being influenced by the Renaissance, I immediately thought of one of my favorite paintings - primavera by bottocelli. I did a few (not great) sketches from it. In this sketch I just love the lines and curves in the hair. 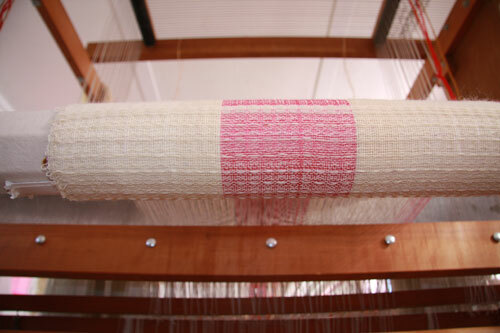 This and some drapes in his fabrics influenced the idea for this weaving. So we have cut and uncut velvet, undulating twill ground, with a layer of dyed monofilament in pickup surrounding a brocade leaf design. 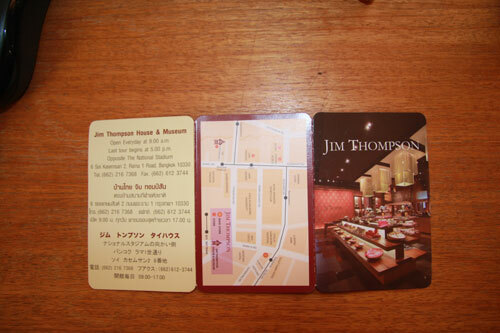 Too much do you think? Playing with photoshop and selecting colours from the image taken from My Fat Pocket website. mel sent me the link. 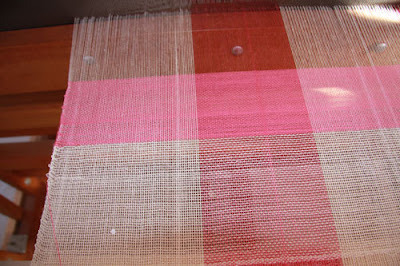 Perhaps an interesting weaving to be done? Text taken from the site. 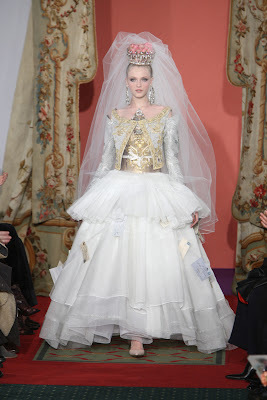 There are some fantastic Haute Couture images on the site in this article it is unclear who some of the images belong to. Some are obvious others not so. Another fantastic artist Eloise Corr Danch her work with paper is incredible. 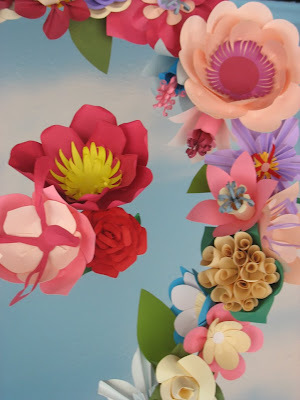 There is a riot of colour, shapes and designs. 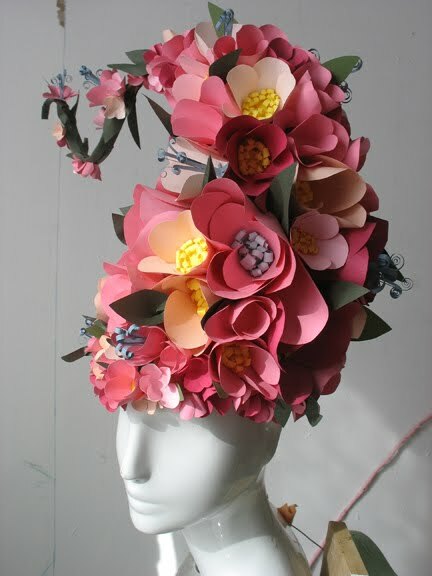 Eloise works in a number of mediums including paper sculpted fashion and flowers. Eloise's portfolio page has so much eye candy I don't know where to start. 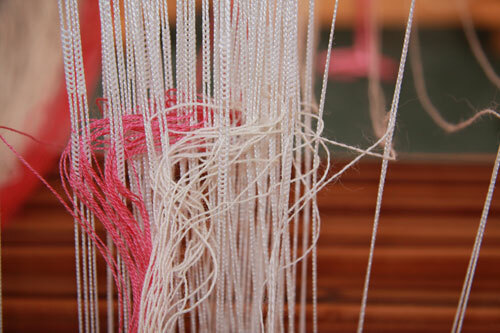 I have been trying this week to wind a silk warp for my 1st Lacroix piece but where is the end? I lover this silk but it has been a nightmare trying to find the end to start, the skien was not tired properly so the ends were not secure. So todays job is FIND THE END!!!! 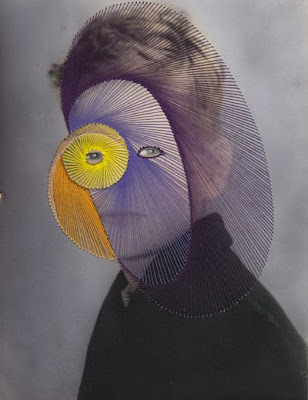 I have just discovered Maurizio Anzeri. In the English Crafts magazine there is an article entitled Camera Obscura page 32 may/june 2010. 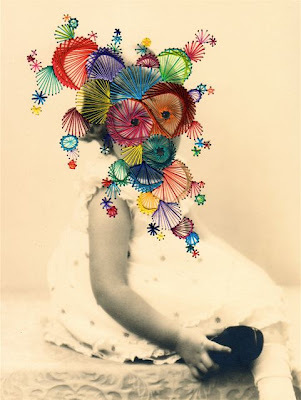 I find his work fascinating and a visual delight. Hmm.. I am afraid I don't have any pictures for this post, but I thought I should do something rather than nothing! I have a lovely stash of things in order to work on some Lacroix projects - silk georgette, netting (both about to be dyed), silk thread, and bottles of nail polish to paint with! 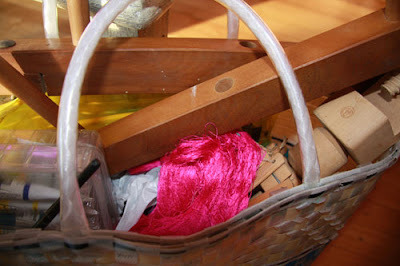 I'm thinking about weaving a floor rug in ripped silk and a thick silk noil pile.. designs are in progress.. 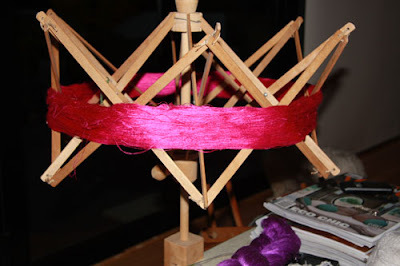 I'm finishing up teaching a few classes this week, so I will hopefully have much more time free to finish that warp and do some work! I'll try to post some pics in the next couple of days..
Lacroix is coming! Thinking thinking. 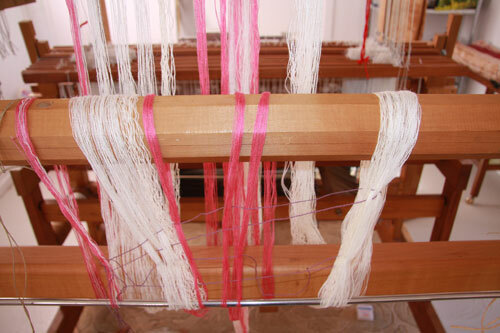 Above two images 2nd scarf and its not going well Having trouble with the tension at the end of the warp I should have extended the cords holding the rod holding the warp as The ones on the loom end so you have wasted a good metre of warp. So I have tried to change it while the warp is still o in t he hopes I can still weave it off but I left it in frustration. Look what I found while cleaning out, so I guess there is good reasons for house work. I hope it is safe with all the unrest in Thailand at the moment. Well not bad although borders was just a visit and I didn't buy anything, it was still a treat to look at books. So list almost complete . Ok what is it with pink? I always go back to pink. Is it a subconscious think? 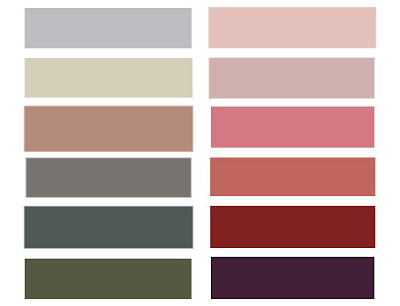 I was never a pink person then at UNI I became a pink person all my work was pink and I started wearing pink clothing. Now my work has gone back to pink. This is the pink and cream warp I wound 2 weeks ago going on the loom today. I have threaded it with a pointed draft 1234321234321. 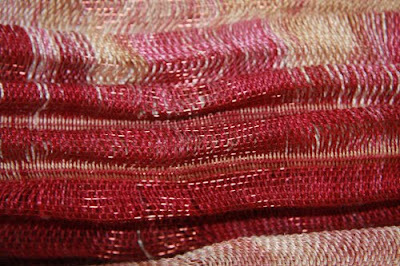 Now the quondery what to weave now? 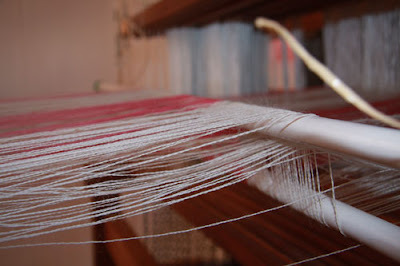 I think the weft isto be all cream and maybe some over spun and some plain weave cream. While studying at Lisio Foundation in Florence Italy some years ago I met a fantastic weaver, Franz Ippoldt. Between 2005 and 2008 Franz was technical director of Fondazione Lisio near Florence and now has his own studio near Lyon France. As you know Mel and I have an obsession with Christian Lacroix. 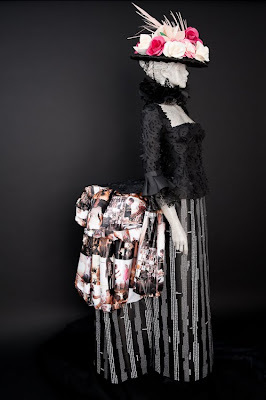 Mr Lacroix is the master of colour, texture and pattern. 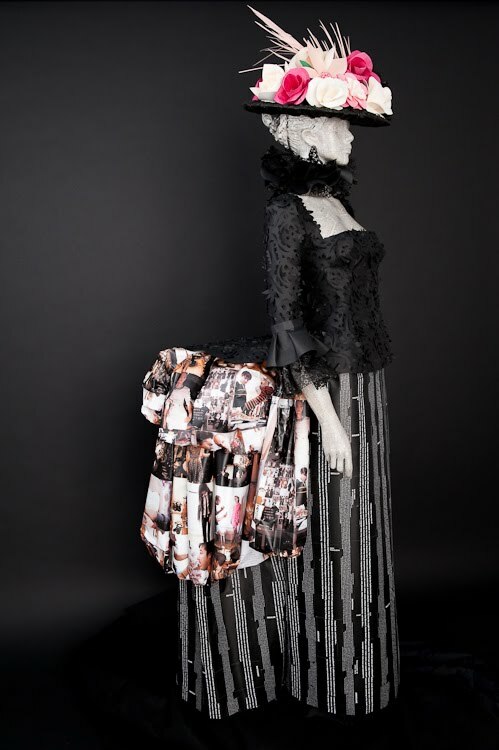 Many of his designs derive their inspiration from the theater and the Spanish Matador. Franz worked on a collaboration with Lacroix in this garment and produced the corsage for the robe in Franz's own words. Now that is a colour combination! Maybe franz should weave something for the exhibition. Well off to the studio I went at 9.00am. I almost finished the mohair waffle weave blankets, but ran out of mohair I thought I could do it but need another skien. 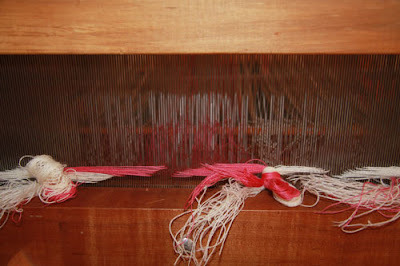 This took me about an hour to complete the weaving. So I will call Carol at Rainbow Wools tomorrow and order some and maybe a bit of loop mohair and brush it after weaving for more blankets ( Mel's suggestion to stop having some many snarly bits). But the day was not all wasted. I wound 3 warps and what to do with them? 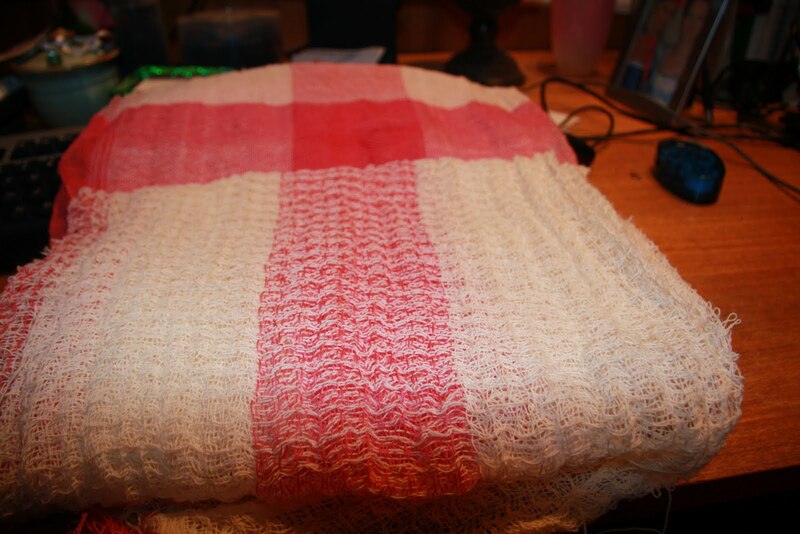 I used a mixture of cream wool , over twisted wool and pink polyester. ( My comment to Mel was to use up some of what I have, hence the polyester) you can see my ruff notes in image no 3.
warp no 1 = cream wool, O/T wool and polyester. Warp 1 and 2 are about 4.5 mts long and 12 inches wide. weird how I always do my lengths in metric and all other measurements in imperial measurements. Warp no3 is about 3.5 mts long and 10 inch wide. 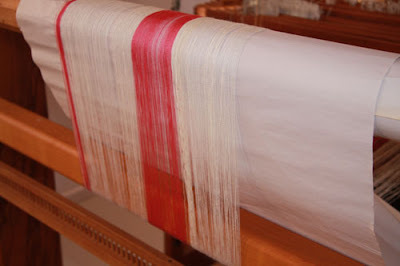 All warps have 20 threads per inch. So what weave structure will I use???? 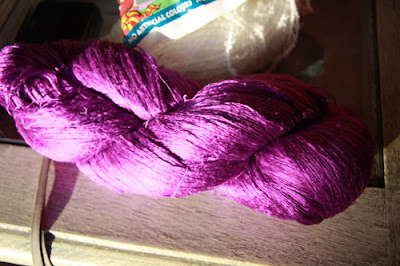 What to do with the warps? Conundrum. This is the trouble with using thread for the sake of it and not really planning. I have to admit I never have any success when I do this so of thing so it will be interesting to see what happens. So all in all it was 1/2 a productive day and now I get to go and look at wedding photo's.